Without putting seed in the ground, a farmer cannot expect a harvest later. Even if you are not a farmer, the same is true for you! If you do not invest money, you have no hope of achieving a financial harvest later. 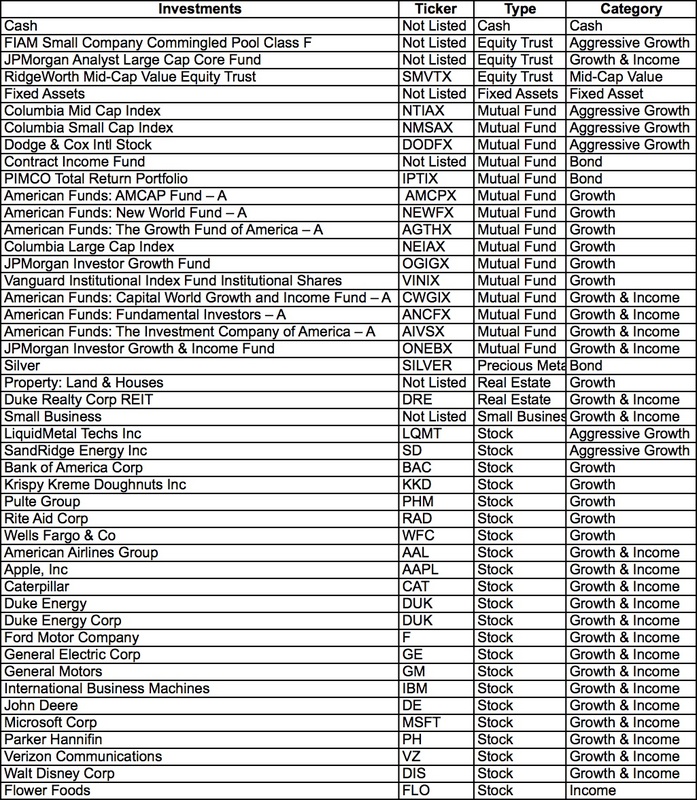 In May, I will have been an active investor for 21 consecutive years. For the first six years of this journey, I invested exclusively into market-based investments. Since that time, I have diversified into real estate and small business along with a dabbling in precious metals. It has worked well for me. Full Disclosure: I am not a certified financial planner, nor do I sell investments, insurance products, or other similar financial products. My goal in sharing this information is to shed light on a topic that very few people understand well. It is my hope that this information will help inspire more people to climb the I Was Broke. Now I’m Not. Ladder (download a free copy HERE) and become investors so they can live fully funded lives. Yet another year has passed, and you will see that I have continued to actively trade stocks. I have sold several individual stocks while deepening my investment into other stocks. 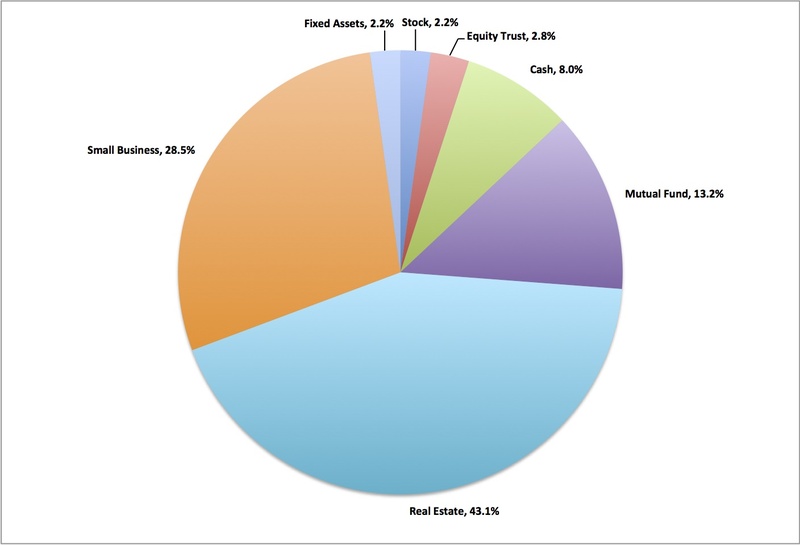 Overall, my investment strategy has continued on a straight-forward path of maintaining a balanced portfolio with approximately 35% real estate, 30% small business, 25% stock market and 10% cash. Speculation Mark Twain once famously stated: “OCTOBER: This is one of the peculiarly dangerous months to speculate in stocks in. The other are July, January, September, April, November, May, March, June, December, August, and February.” Rather humorous and spot on for short-term investors. This is why the majority of my investments are being held for the very long term. 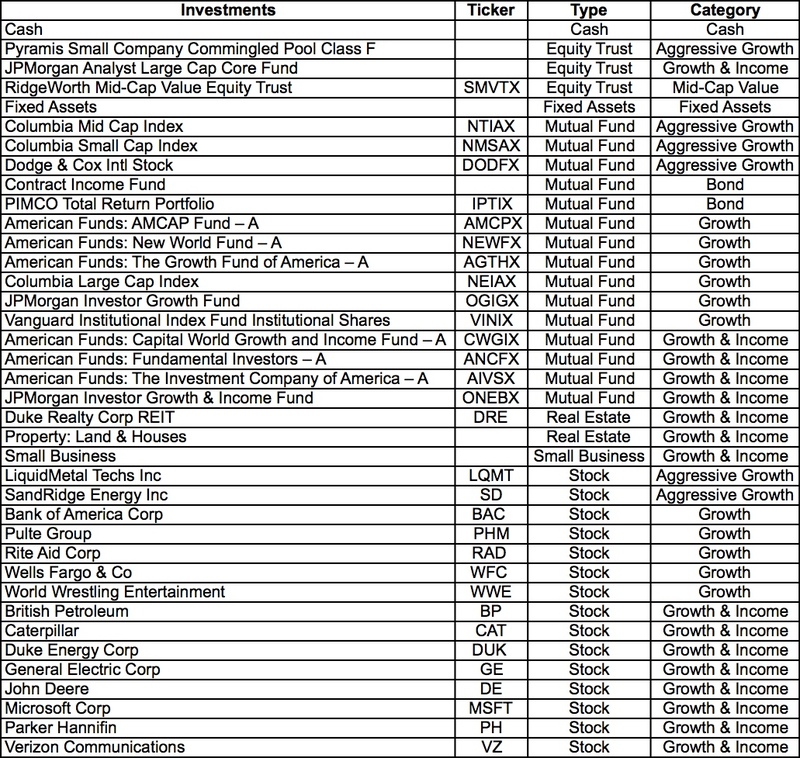 Notice that my individual stock investments only comprise 3.74% of my overall net worth. Deals will be found – but they will have to be looked for! A lot of the great and easy investment choices are gone from the market. Real estate prices have recovered. Businesses are doing well. Precious metals have stabilized. Finding a great investment opportunities will require diligence and focus. The wildcard: Tax Reform Who knows where potential tax reform will take us?! Some investments made attractive due to special tax advantages could fall out of favor with investors if they sense that those tax advantages are in jeopardy. And it is true. A farmer knows this intuitively. A harvest is impossible without investing seed into the ground. The same is true for your finances. If you do not invest money, there is no chance of an abundant harvest. Occasionally, I update everyone on the investments I currently hold. Below is a chart of the current investments we hold. If it is publicly-traded, I have included the ticker symbol. Click on the chart itself (or HERE) to see a larger version. It’s crazy that yet another year has passed and if you look at my 2015 update, you will see several investment changes. This is due to several trades in individual stocks as well as the continued acquisition of real estate and growth of our business holdings. You can click the pie chart below to see a larger version. Stock Market turmoil – I believe the stock market will continue to experience a “roiling effect” due to the continued re-balancing of oil supply, China economic transition, political election cycle of the United States, as well as P/E (Price-to-Earnings) being appropriately priced. Until real sustained economic growth is proven over several consecutive quarters, it is difficult to see rapid growth of stocks. Dividends rule – Right now, there are many companies who have chosen to increase their dividends because company leaders apparently see few opportunities to better use the money. Entrepreneurial spirit – Individuals who choose to grow will be the ones who experience substantial and sustained growth of their investment portfolio. There are fewer “passive” growth opportunities right now than in the past ten years. Those who choose to lean into “risk” will be the ones rewarded with returns. It is hard to believe that another year has passed by! If you look at last year’s update, you will see quite a change in the allocation of my investments. This is most noticeable in our real estate holdings. This is due to acquisition of more properties as well as the appreciation in the value of other real estate holdings. 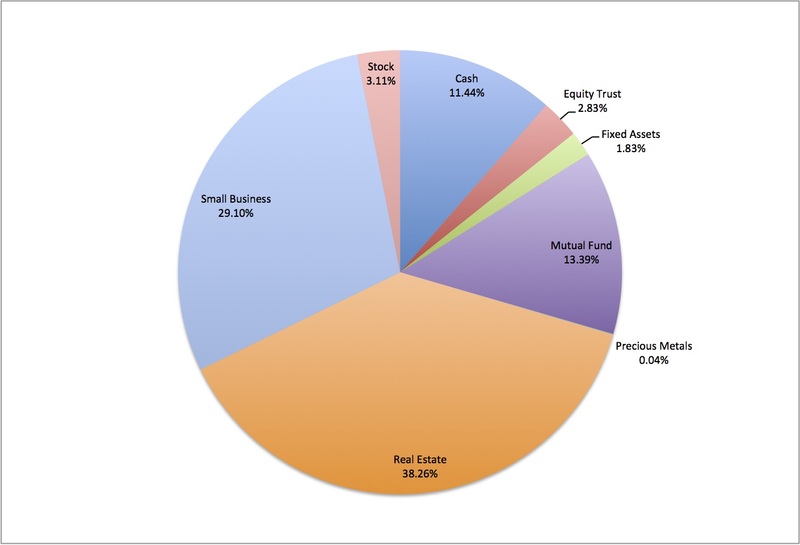 You can click the pie chart below to see a larger version of the chart. I continue to believe there will be ample investment opportunities within the real estate markets in 2015. I travel throughout the U.S. and Canada and rarely have I seen construction – both large-scale commercial and residential – at the levels I’m observing right now. It’s only a matter of time before this shows up in the profit statements of the largest contractors. Worldwide instability has existed since the beginning of time. It exists today. While the problems may change names tomorrow, I’m convinced we will still face worldwide instability tomorrow as well. I believe a great risk is in not investing at all. I will continue to be an investor!